Welcome to Christmas Cookie Week! I love holiday baking, and I’m going to try to control my exclamation points but I’ve eaten a lot of cookies this afternoon! And Christmas is coming! Christmas! Cookie! Week! In my family, there are certain foods that Must Be Made for certain holidays, and having tins loaded with cookies is a Christmas necessity. 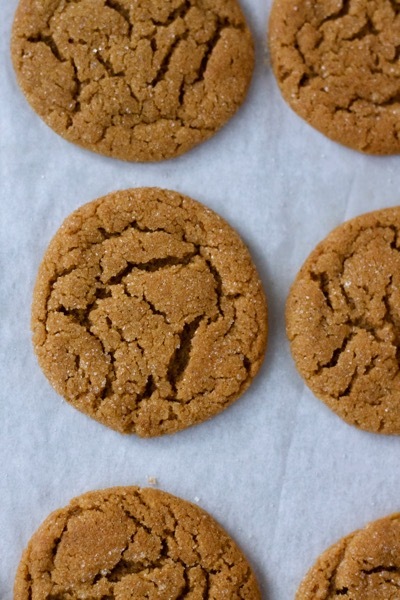 And the most necessary cookie is definitely the gingersnap. I have very old memories of shifting the cookie tin around after dinner, trying to find the biggest one (um, I’m still her). 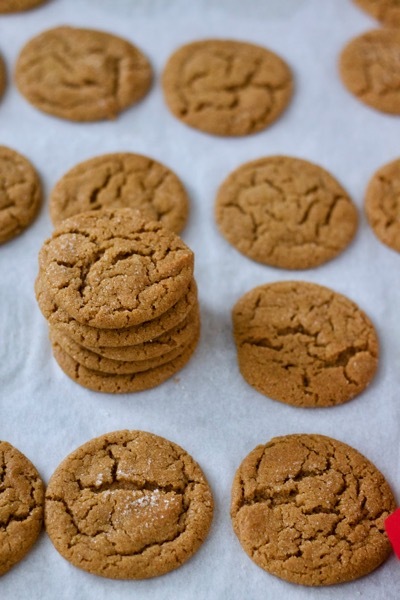 Actually, my dad always called these “gingerbends” because these aren’t the break-your-teeth grocery store gingersnaps, and they’re not thick and cakey like molasses cookies I’ve had from a bakery – they’re perfectly dense and chewy. 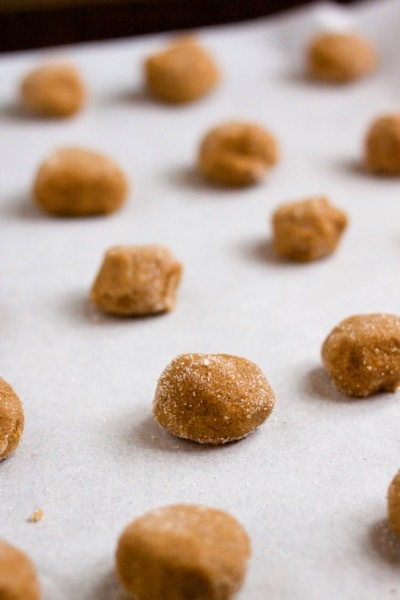 They taste like Christmas to me, with the warm ginger and cinnamon spiciness, the not-just-sweet edge of the molasses, and the crunch of the sugary coating. The dough is simple – mix shortening, sugar, an egg, and thick, syrupy molasses together. Then add all the dry ingredients and crank up the mixer! I rolled the dough into quarter-sized balls and my three-year-old did the sugar-rolling step. I demonstrated gently moving the soft dough balls around in the sugar, but she quickly developed her own method of picking them up and dropping them down from several inches above the bowl. “This is how I do it. I pick them up and PLOP! them down.” I’m trying to be less of a micromanager when she helps in the kitchen, so we rolled with it (heh, you know you love it) and I even restrained myself from too much reshaping once they made it to the cookie sheet. Two points for mom. 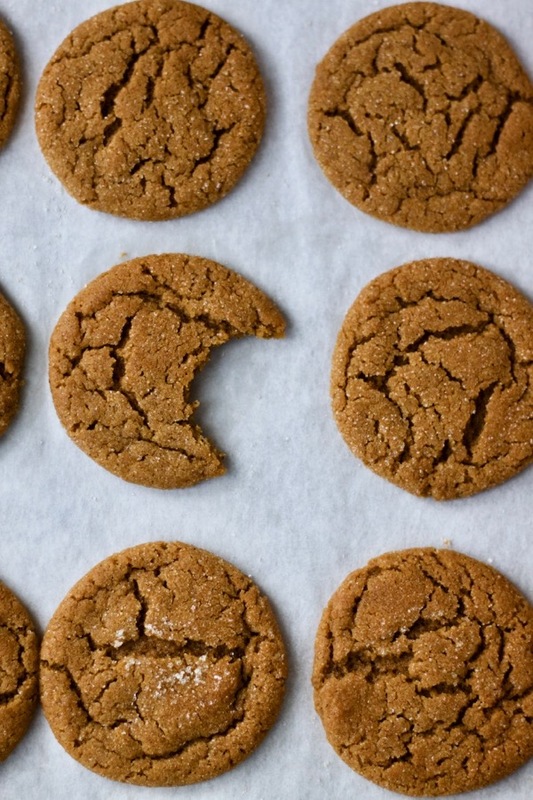 The gingersnaps flatten and spread as they bake (and get that beautiful cracked surface!) so give them some elbow room on the cookie sheet. They’re in the oven for a quick 9 minutes and cool on the cookie sheet! There’s so much personality in that crackly surface! Make some gingerbends and spread the taste of Christmas to everyone you love. Preheat oven to 375. Blend shortening, sugar, egg, and molasses in a large bowl (I use my stand mixer). Add flour, baking soda, cinnamon, cloves, ginger, and salt and mix until well-combined and dough comes together. Roll dough in balls the size of a quarter. Roll these in sugar (you need 1/4-1/3 cup in a bowl). Place on a parchment-lined baking sheet, 2 inches apart. Bake 9 minutes, until they are crackly and getting firm at the edges. Cool on cookie sheets. I have made the gingersnaps with butter in place of the shortening. The cookies spread more and I prefer the texture with shortening, but you can use an equal amount of butter if you like. I highly recommend doubling the recipe! This recipe is from my Nana – my dad’s mom. This post was originally published in December 2014, and most of the pictures were updated in December 2017. In a wave of she’s-growing-up-so-fast nostalgia, I left the pictures of my then-three-year-old oldest daughter helping me! Too sweet to forget. Not fair, and also extremely dangerous. Because I can’t stop eating them. And maybe it’s okay to eat cookies every time you’re in the kitchen for one week, but not for two…. MMM! Wish these were baking in my kitchen right now and filling the house with their wonderful spicy fragrance! But if I made them now there wouldn’t be any left by the time my family arrives for Christmas. Homemade cookies and self-control are not things I can have simultaneously. Meeeee neither. Must be genetic.